They don't wear jumpsuits nor carry proton packs, but that doesn't phase them. If you have a technical problem in Battle Ground Public Schools, you know who you're gonna call: the BGPS Tech Department. 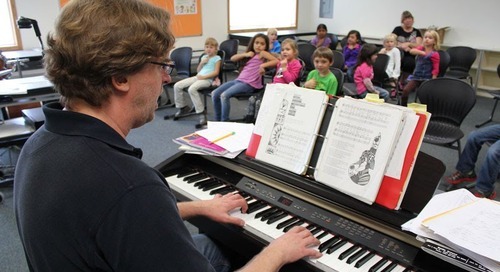 The team of dedicated professionals in the district's technical department ensures that students and staff have continuous access to the tools they need to engage with and deliver innovative lessons and educational programs. It means that they constantly educate themselves about technology changes that could benefit students and staff and plan for the implementation of new technology. It means that at any given time, a technician could be alerted to a server or Internet disruption to which they must quickly and efficiently respond. "The great thing about this department is that every single person gets what we are here for," said Scott McDaniel, the district's director of technology and security. "It's not just making stuff work. Not only are they great IT people, they are part of the educational environment. I hear it from our teachers. I see it when kids are opening Chromebooks, and they're genuinely engaged in learning. That is what we support." The tech department not only fields more than 850 help desk requests each month, but it also supports a dizzying number of devices: 6,000 Chromebooks, 2,000 iPads, 2,500 personal computers, 1,200 phones and 50 virtual servers that the more than 1,200 staff and 13,000 students use every school day. 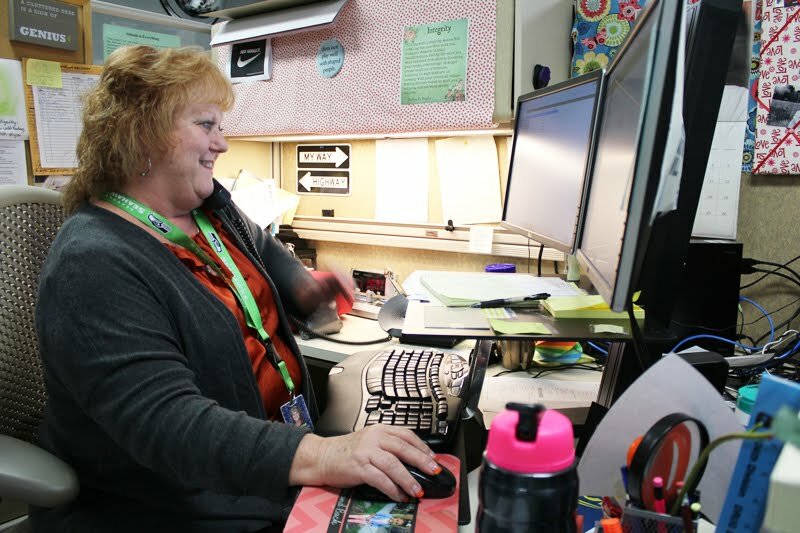 The 16 people on the district's technical team each have an area within the district for which they provide technical support, from the help desk and desktop technicians and trainer who serve on the front line, to the network technicians and an assistant who solve problems and provide technical services on the back end. Help desk technicians Cheryl O'Dell and Seth Gittlen arm themselves with little more than phones and computers, but the dynamic duo fields hundreds of requests for technical help. In September, the help desk looked into 1,925 new tickets. The majority of the requests they resolve and close without escalation--often it's a password reset or email help. Sometimes they'll use a remote desktop application to see a staff member's monitor and guide them through a fix. "I enjoy giving people the help and information that empowers them to be successful in their jobs," O'Dell said. Other times they must search for the information to solve a problem. "Everything continues to change," Gittlen said. "We Google everything as much as anyone else." 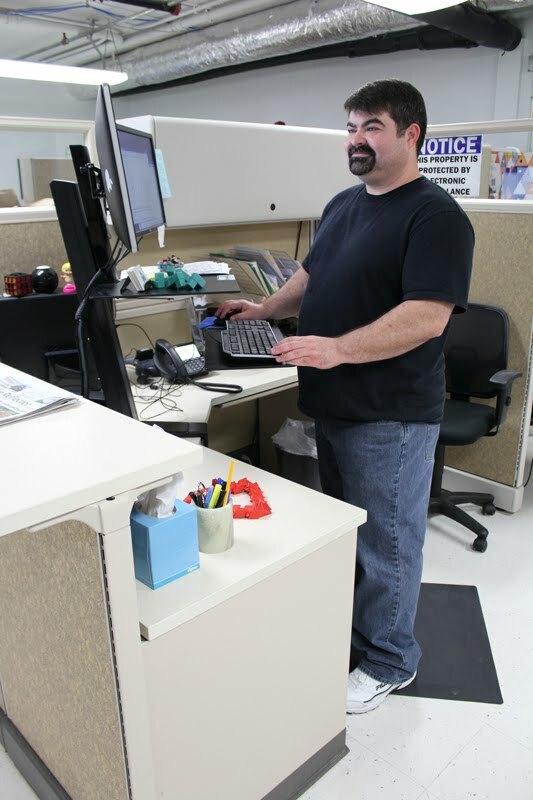 But if an issue requires some hands-on finesse, the help desk technicians send the request to one of the department's six desktop technicians. 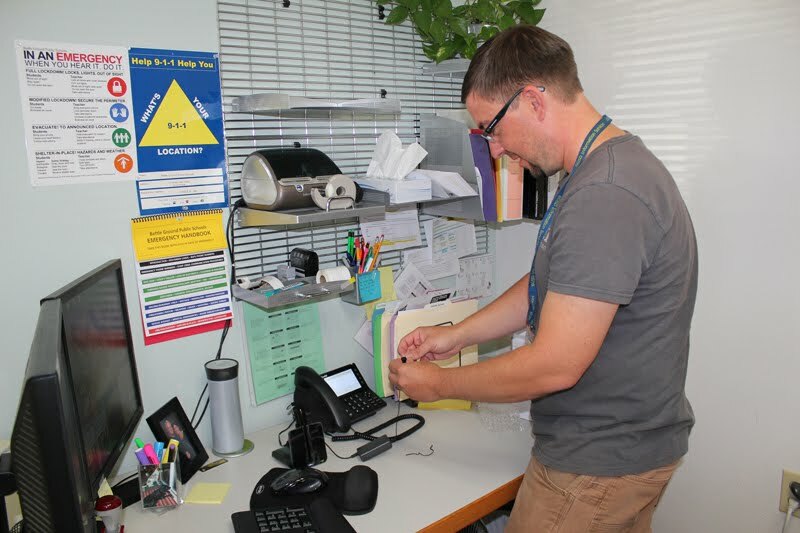 Each technician is assigned a campus or two within the district where they do technology installations and setups and provide maintenance and support for Chromebooks and other devices. A low-voltage technician maintains network cabling and phone wiring and looks after clock systems, intercoms, bells and bell schedules and video cameras and projectors. One way the small department is able to successfully provide so much support and training is through its technology gurus at each school. The tech department has enlisted the help of teachers and staff who receive additional training that lets them train others in their buildings and provide one-on-one consulting. The district's Academy teachers are well-known for their technical enthusiasm in the classroom and support of their fellow teachers in learning new apps, such as Hapara and Google Classroom, that educators can use to build creative assignments and increase engagement in the classroom. "Once they get themselves fully invested in Google and using Hapara, it represents an incredibly rich ecosystem," McDaniel said. "And once we get there, we'll be able to go further faster." 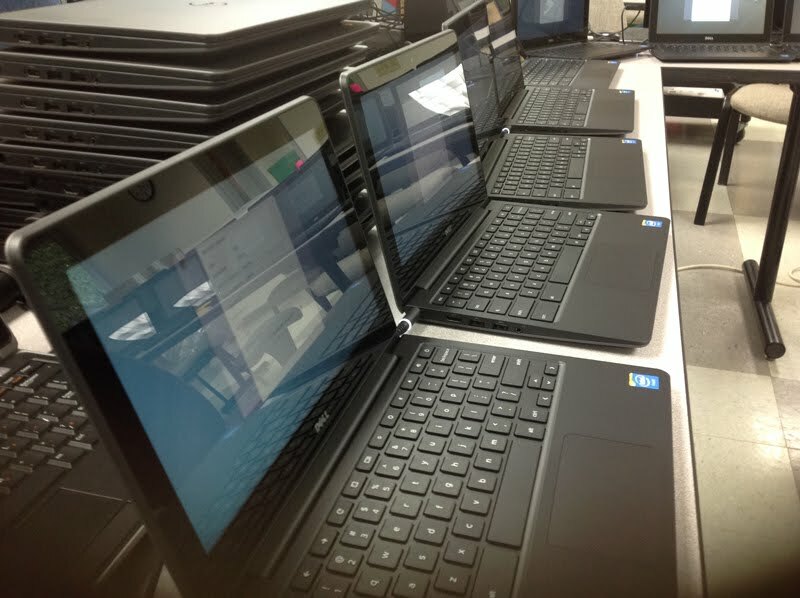 Last year, the district purchased 2,400 Chromebooks for collaborative learning. An additional 2,200 Chromebooks will hit classrooms this fall, bringing the district's total up to 6,000 of the devices for student use and a ratio of one Chromebook for every two students. 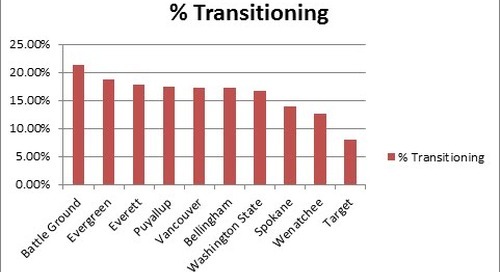 Besides Chromebooks, the district is also nearly doubling its wireless access points to a total of 800 around the district. More access points means better technical performance when students are accessing educational applications and assessment websites. Still, technical problems happen. On the front line, the help desk staff is ready to answer questions posed by the district's 1,200 staff members. While they recommend people search for answers to how-to questions on the web before sending it to help desk, they encourage technical exploration. "Get in there and play," O'Dell advises. "You can't break it." But if you do discover something weird while using district technology--and it don't look good--call or email the help desk at 885-5444 or helpdesk@battlegroundps.org. In case you're thinking by now that they have superpowers, they don't. But they wish they do.They would love to have superpowers. Help desk technician Cheryl O'Dell would like to read minds. Help desk technician Seth Gittlen wishes he had super speed. Network technician Vince Moore would like to make it snow. And educational technology coordinator Evyan Wagner wants to clone herself.